Kids, they grow up fast. Though 13 year old Moziah Bridges is no ordinary kid. At an age, when most of us were playing video games and just getting familiar with the fascinating world of the internet, this boy wonder founded an online business. 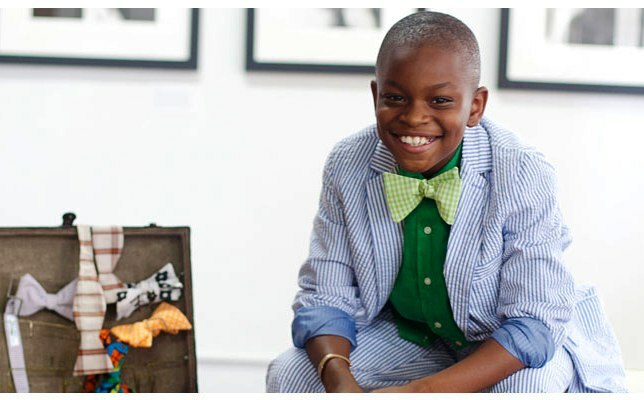 Discovered by the entrepreneurship reality show Shark Tank in 2012, Moziah Bridges, lovingly called “Mo”, turned his affinity for sharp dressing and fashion into a business when he started a line of hand-crafted bow ties for young men and boys. “I like to wear bow ties, because they make me look good and feel good”, the then 11-year-old Mo had said while on the show. Assisted by his mother-manager, whom Mo referred to as “Mommiger” on Shark Tank, the young CEO sought out $50,000 for 20% stake in the company. Mo had always liked to dress up well and sharply but he found that he could never find any bowties that he liked or suited a young man. His grandmother, a seamstress taught him to sow ties, and the seeds of the business were born. Soon Mo was making more ties than he needed for himself, and was selling them online and a few retailers in the area. Today, the colourful bowties that retail between $40-50, have found over 10,0000 takers already and the company has 5 employees on its rolls including Mo’s mother and grandmother. The business has got a lot of interest from Forbes, Business Insider and others, and Mo has been been mentored by entrepreneur Daymond John who was impressed by the young CEO on the show. John has advised Bridges to continue to avoid investments as he builds his company, and to not grow too quickly. Rather than expand into denim, for example, John recommended that Mo’s Bows expand into neckties. “Mo is a little phenomenon in the US. He has already been on the cover of many fashion magazines. Born in Memphis, Tennessee, his 1930s style has a nostalgic appeal that lures in even the more famous television shows.”, France TV said about the prodigy. Bridges says that his recent success has inspired his friends back home, and that John taught him that with success comes the responsibility to give to others. It’s why Bridges decided to make an annual bow tie and use 100% of the proceeds to help underprivileged kids who want to attend summer camp. Today he is still managing school and making bow ties, but Bridges has plans to attend college and launch a full fashion line by 20. “Figure out what you like doing, and then find a way to make money doing it. Figure out, find out”, says the young visionary, displaying wisdom beyond his years.